Since Mother’s Day is just around the corner, we were asked to bring a dish honoring our mothers. You know, something mom used to make. So I flipped open the three-ring binder my mom gave me a few years back, filled with the recipes she’s collected over the years. I love thumbing through the various recipes — and seeing where many of them came from (“Grandma Martha’s Sewing Class” is my favorite). It gives a perfect hint of a rich history and tradition. There are even a couple of recipes that just say “Andrew” beneath the title — a clue that I’ve long enjoyed spending time with mom in the kitchen. It’s funny, with all the cookbooks we have in our kitchen, that’s the one I go to most often. 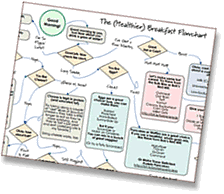 And if you scan through many of my posts, you’ll probably notice that there are a lot of “Thanks, Mom!” parentheticals peppered throughout. When I pause to think about how much I know in the kitchen, a heck of a lot of it came from her. So, thank you mom, for teaching me so much, for your inspiration and guidance, and for your Rule-of-Three. * Also, for this super-simple four bean salad recipe, which takes just about four minutes to make. I love you. 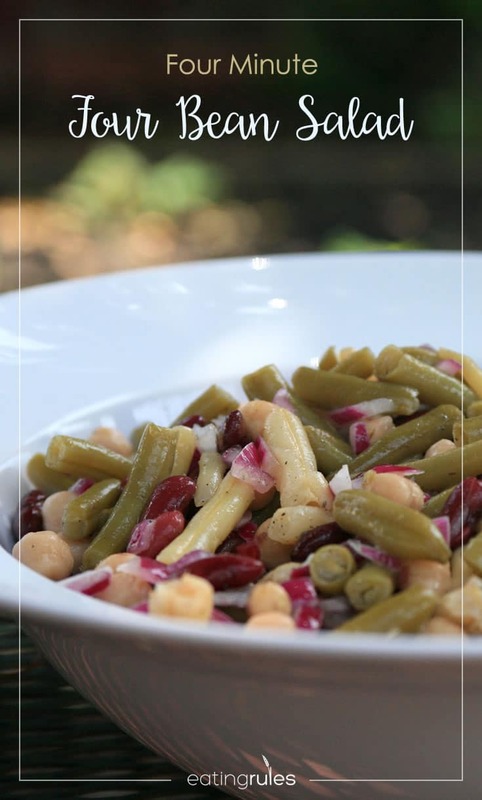 A perfect side dish for a summer picnic! It's best when made a day or two before, so the onions have a chance to pickle a little bit in the vinegar, and all the flavors have some time to get to know each other. Open all the cans and empty the beans into a colander in the sink. Rinse. Add all ingredients to a large container, ideally one that has a leak-proof lid. Attach the lid and roll or flip the container to mix the ingredients. Refrigerate for at least a few hours (overnight is better). Roll or flip the container occasionally to help it marinate. Serve cold. * Mom always insisted I try something at least three times before giving it up. Soccer practice, piano lessons, whatever. I had to go three times before I was allowed to quit (which often didn’t happen after that third time). Smart woman, that one. 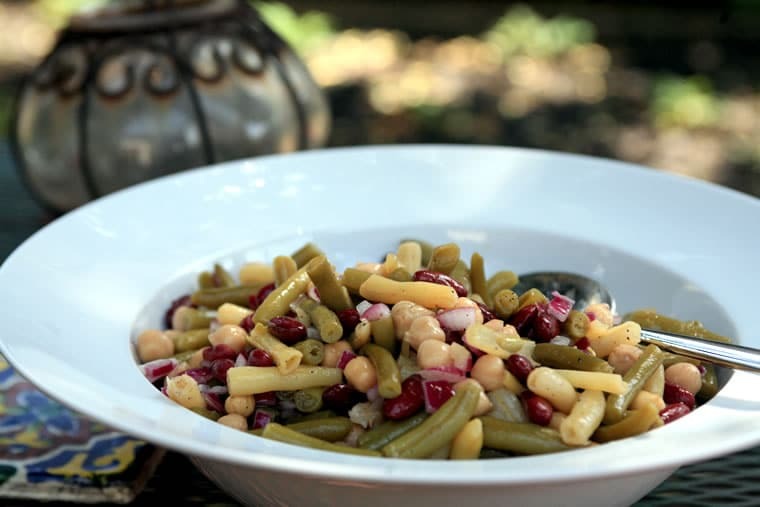 Oh yeah, this bean salad is GOOOOOD! You could throw some into some cooked chewy grains (farro? wheat berries?) and have a wonderful summer grain salad, too. Very versatile, as well as delicious! I haven’t made it in so long – that picture is tempting me to open a few cans and throw it all together. Nice change, Andrew, with the olive oil and the red onions in the picture. It’s interesting how so many memories are around food! I suspected you had a terrific mom and your post confirms my suspicions. Andrew… I have to admit I’m a big fan of bean salad, but I also have to admit to never have made it before. This recipe certainly looks like a winner. A lovely post to honor your mom!! Thank goodness for smart and awesome moms!! 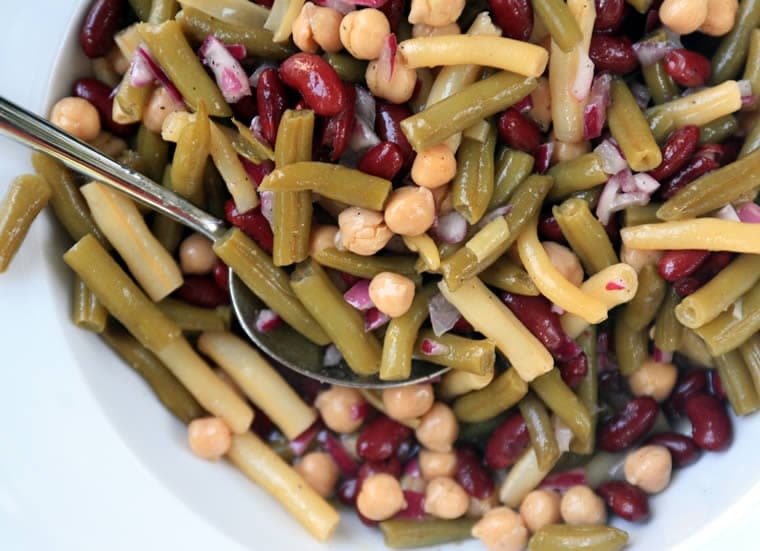 I love a classic four bean salad and can’t wait to try out this version!